Vintage Electric Guitars and Amplifiers - Read About Us! Have been playing a variety of musical instruments since I was 8. Picked up a guitar at 12. Never looked back. B.A in Archaeology, ancient cultures and religion from Tel-Aviv University. Graduated with honors. Worked at a grand Piano restoration workshop for 15 years, doing overhauls on 50 -150 years old instruments, specializing in traditional woodworking techniques. Specializing in ancient metalworking techniques. Designer of the modern classic “Little Sister” guitar for B&G Guitars and an avid guitar collector and restorer. This is a story about a journey of two bearded men. A story that starts with a search and ends with a guitar. If we need to pick someone to blame for it all, it would probably be Robert Johnson. On one of David’s birthdays, long ago, as he was working in his workshop, he came upon the famous photograph of Robert Johnson holding a worn L-1 guitar. As he was looking at the photograph he was struck by the fact that the early bluesmen were able to bewitch an audience with their prowess. Only one man and his guitar, travelling throughout the land. David’s fascination with pre-war and turn of the century guitars grew. He was Looking for one of these small body guitars. It took only a few days until one was spotted lying in the corner of his barber’s shop. It was in a bad shape and had only three strings on. Being in a barber shop, he grabbed a pair of scissors to use as a slide. Magic! He got the guitar as a gift and from that day on he delved into the world of Delta Blues and fingerstyle playing. 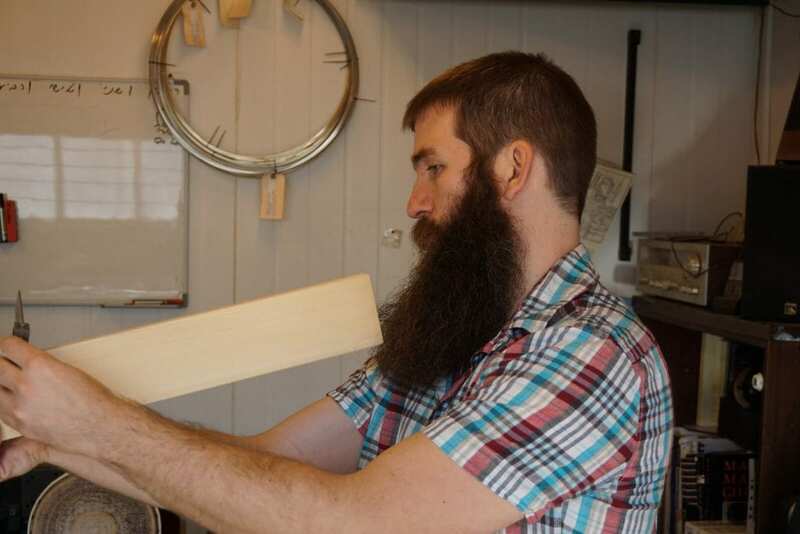 He became obsessed with restoring and playing these antique instruments, but there was always something missing. What if it was possible to recreate the spirit and mojo of such instruments and bring back those days of glory past. 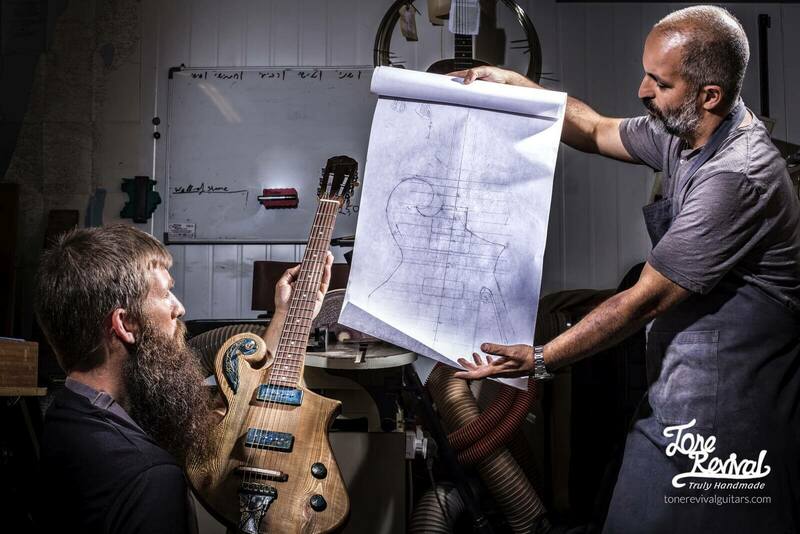 Designing and building uniquely handcrafted guitars that would be a lifelong companion. 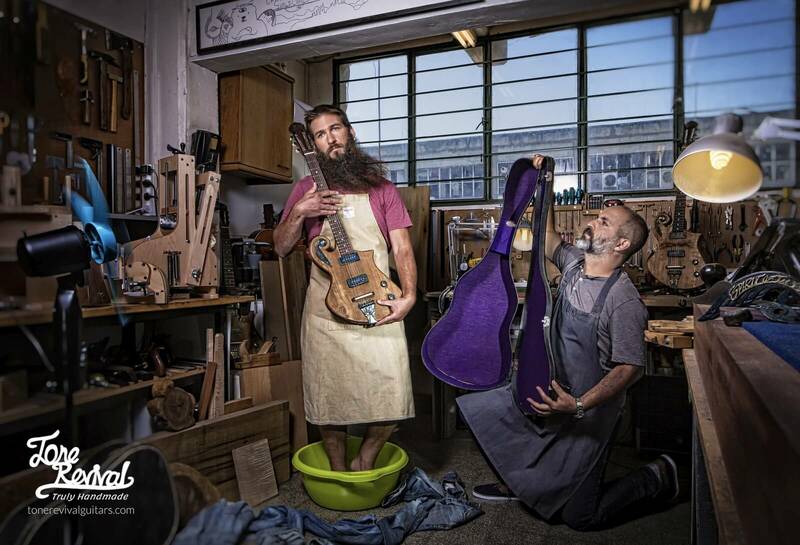 The first thing he did was learning the arts and crafts of guitar building at Jacob’s Algranati School of Lutherie. This school was the birthplace of many luthiers and guitar companies. After creating the first prototype of the Little Sister guitar which was given to our friends at B&G Guitars (named after David’s second daughter) and became an instant success and an international phenomenon, David was considering his next step. 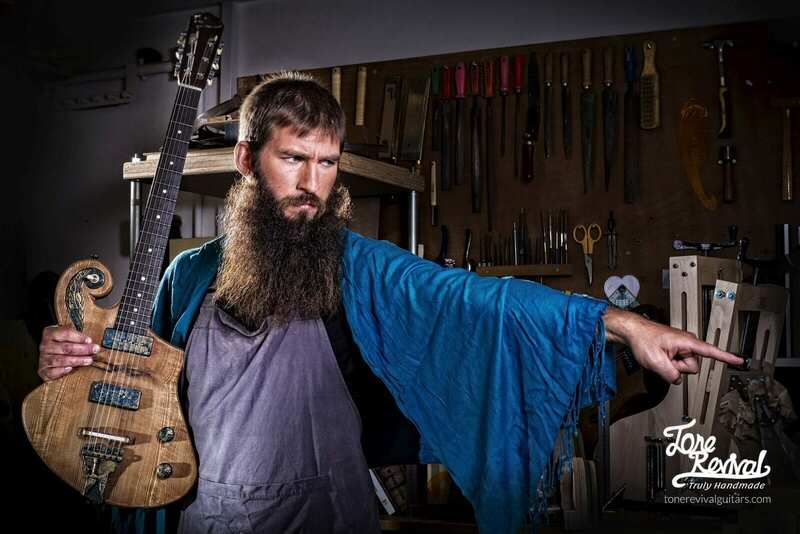 All this time he had a vision of a design that originates from outside the realm of guitars. Something that encapsulates the spirit of adventure. An original, one of a kind instrument. 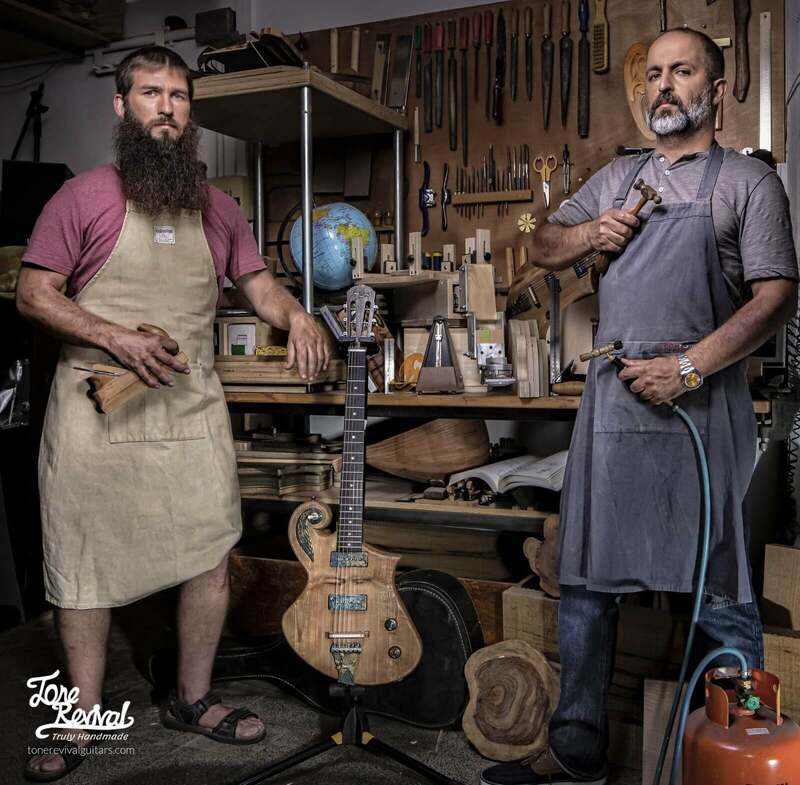 While going back to the drawing board at his workshop, David was looking outside his window and had to check his eyesight, because on the other side of the building, right across from his workshop, there was a luthier working in his own workshop. He also had a beard!!! David quickly went over there, and after a short introduction and a beer Benjamin, the luthier, became then to-go person for restoring David’s guitars, and the future partner in crime for all his future endeavors. Spirit of the Wind was born out of this newly founded partnership as Benjamin carefully executed David’s vision. The result exceeded our expectations and paved the way to a much more ambitious path: restoring the lost art of truly hand made instruments.